Yesterday I showed off an unfinished star. 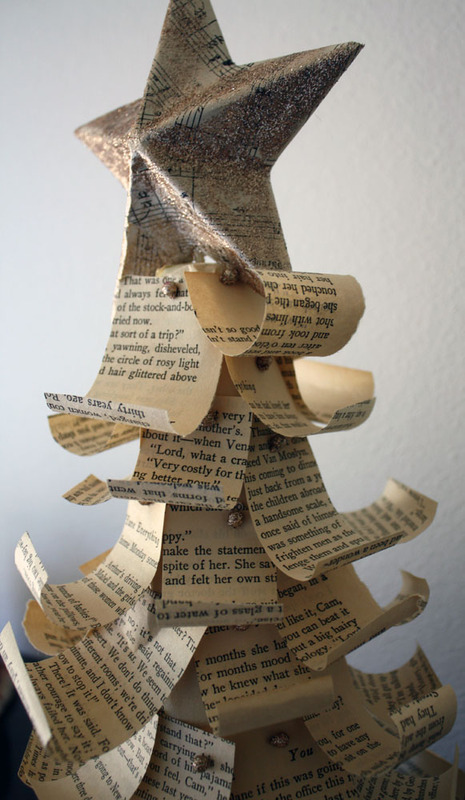 It's the topper for this Rolled Paper Christmas Tree. 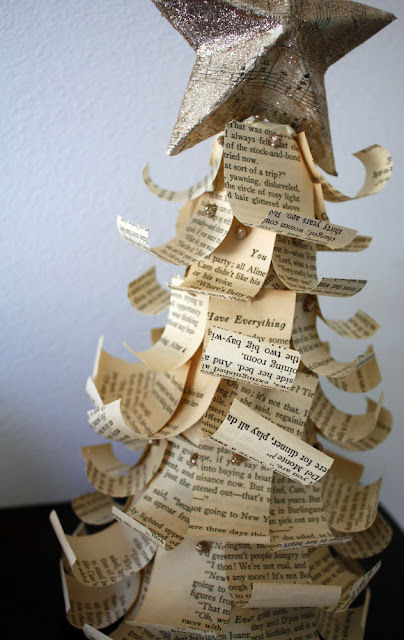 As I mentioned yesterday, the idea and instructions for this project were from Kayla Aimee's How to Make a Rolled Paper Christmas Tree. I followed her instructions. . .mostly. My change #1: Instead of using brads or straight pins to adhere the first layer of paper on the foam cone, I just used some masking tape (since it was about the same color as the book pages I was using). My change #2: I DID use straight pins to attach the rolled strips. However, I didn't want to have to place the strips so tightly together to cover the pins. Instead, I used straight pins with ball tips, dipped the ball ends in white glue then glitter, and allowed the glue/glitter to dry. I kinda think that the glitter balls look like sparkly old mercury glass ornaments. Especially on the few where the color peeks out a bit. My change #3: I didn't cover the top the same way she did. Since I let my straight pins show, I just needed to cover the circle of foam that was still exposed. Masking tape came in handy once again to simply cover that area. 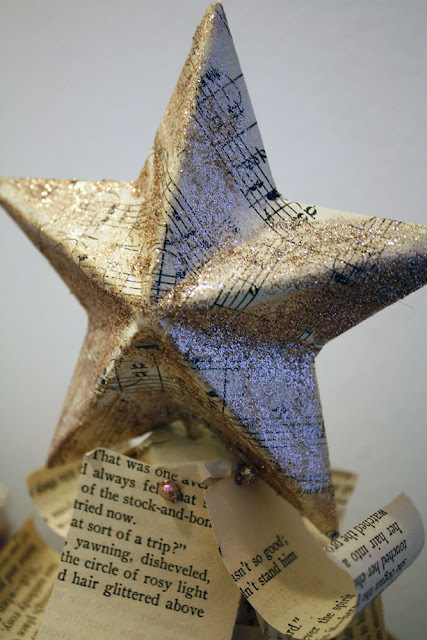 With my star glittered and sunk into the top, you'd never notice that there's tape below it. Of course, that's all you can see now isn't it? Hmmmm. 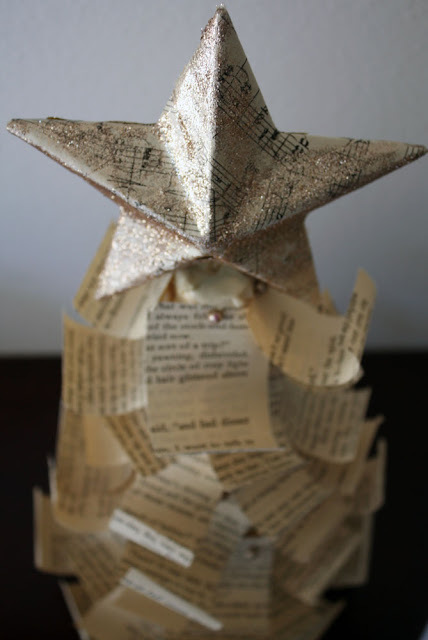 As far as how I made the star. . . It was a paper mache ornament on clearance at Michael's. I clipped off the gold thread loop and used an awl to punch a hole in one of the angles. Then, it was just a matter of decoupaging bits of sheet music to it. I used E6000 to glue a small wood skewer into the hole. White glue and glitter gave it some sparkle. Easy peasy! I think it's just the bit of vintage whimsy my foyer needed. Very cute, Hope. I love the addition of the glittered pins. Looks like little ornaments. I LOVE this tree, Hope! I love what you did to the pins. I noticed them right away and thought how clever! They do look like the old ornaments. This is fantastic! I have to keep it in mind since paper is becoming a big part of my creative time lately. 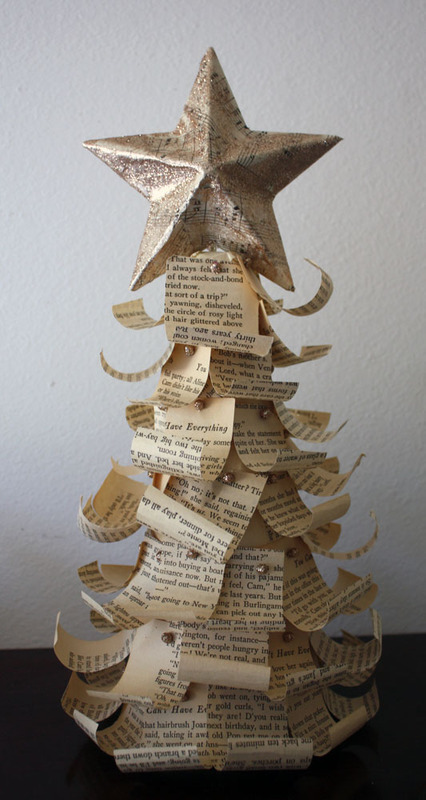 This looks great- love what you did with the pins! Kayla- Oh wow! This means so much to me. I just wanted to do your tree tutorial justice! I'm so pleased you approve. Yay! :) Thank you.